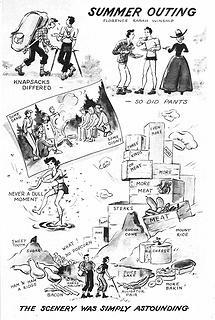 I ran across this drawing by Florence Sarah Winship in the 1945 Mountaineers annual with a lighter take on the summer outing. Do you think she thought there was too much food? I can only imagine the reaction from any of the Parks if the Mountaineers attempted one of their big trips now. Horses,, cookstoves, wood cutting, mounds of food and belongings. Up to 200 people on an outing. Park managers would have a collective heart attack. There used to be an annual climb of Mt. Adams that saw close to a thousand summit in a day. Note the knapsack cartoon. When I was growing up we always called them that - as opposed to backpacks. A knapsack was a day pack. Heck, i'm only 62 and don't look or feel it. And after these years I still don't see why they call book bags a backpack. I used to take a knapsack (book bag) to school when no one else did. I owned an old army one that I still have. My backpack was for backpacking and it was at home and not at school. Today one name fits all. Backpack. I recall reading an account from an outing to Mt Olympus, one of the ways they packed enough food was to have some cattle walk in to camp and slaughtered at the camp. I suppose its stuff like that that lead to the development on the LNT ethic. They also shot at any wolf that came around. The Mountaineers Club? 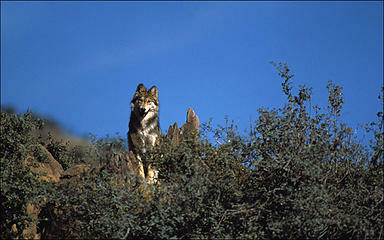 Sub-species Mexican Wolf in Arizona. They also shot at any wolf that came around. Mountaineers Club? kindly provide citation for above statement. I'm still looking. It is wrong of me on a history subject to assume that something happened if I can't prove it. Forget about the wolf bounty and the cattle and dog thing, and the hiker culture of those times. I'll find the evidence in Mountaineer history, not that it matters anymore. i just want to be perfectly clear about this subject. I mention the Mountaineers Club with a question mark. ?? There were hunters in the Olympic mountains from the old settler times. Those settler/hunter types were responsible for a lot of grief in many of our (now) parks and wilderness areas. In fact, the slaughter of the wildlife is what caused the creation of many of our parks and remaining wilderness. I'm not sure if any Mountaineer Club group shot at any wildlife and that is what the question mark is about. Let there be no doubt that I advocate for, and I will miss no chance to remind folks about the original home in the Olympic mountains of the grey wolf. We're going back home! I'll answer your other stuff later. Happy Birthday Crazyforthetrail, Exposed !